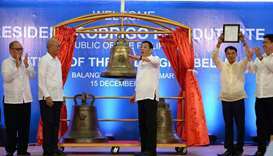 Residents of an eastern Philippine town on Saturday cheered as three revered church bells seized by US troops as spoils of war returned home after more than a century. Qatar Airways has announced the return of its recently-launched seasonal routes to Antalya, Bodrum, Mykonos and Malaga, with more flights and upgraded aircraft on two routes from May 2019. The Qatari bowling team were accorded a warm reception on their arrival in Doha on Sunday after winning the boys' overall title in the World Youth Bowling Championships held in Detroit, USA.